This multi-coloured firework display is a cluster of stars known as Messier 15, located some 35 000 light-years away in the constellation of Pegasus (The Winged Horse). It is one of the oldest globular clusters known, with an age of around 12 billion years. Very hot blue stars and cooler golden stars are seen swarming together in this image, becoming more concentrated towards the cluster’s bright centre. Messier 15 is one of the densest globular clusters known, with most of its mass concentrated at its core. However, this sparkling bauble has hidden secrets. Astronomers studying the cluster with Hubble in 2002 found there to be something dark and mysterious lurking at its heart. It could either be a collection of dark neutron stars, or an intermediate-mass black hole. Of the two possibilities it is more likely that Messier 15 harbours a black hole at its centre, as does the massive globular cluster Mayall II. These new, deeper, observations were taken in order to explore the globular clusters within Abell 1689 . This new study has shown that Abell 1689 hosts the largest population of globular clusters ever found. 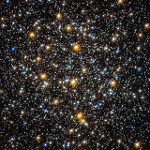 While our galaxy, the Milky Way, is only home to around 150 of these old clumps of stars, Hubble has spied some 10 000 globular clusters within Abell 1689. From this, the astronomers estimate that this galaxy cluster could possibly contain over 160 000 globulars overall – an unprecedented number. This new infrared image from ESO’s VISTA telescope shows the globular cluster 47 Tucanae in striking detail. This cluster contains millions of stars, and there are many nestled at its core that are exotic and display unusual properties. Studying objects within clusters like 47 Tucanae may help us to understand how these oddballs form and interact. This image is very sharp and deep due to the size, sensitivity, and location of VISTA, which is sited at ESO’s Paranal Observatory in Chile. Globular clusters are vast, spherical clouds of old stars bound together by gravity. They are found circling the cores of galaxies, as satellites orbit the Earth. These star clumps contain very little dust and gas — it is thought that most of it has been either blown from the cluster by winds and explosions from the stars within, or stripped away by interstellar gas interacting with the cluster. Any remaining material coalesced to form stars billions of years ago. The NASA/ESA Hubble Space Telescope offers an impressive view of the centre of globular cluster NGC 6362. The image of this spherical collection of stars takes a deeper look at the core of the globular cluster, which contains a high concentration of stars with different colours. Tightly bound by gravity, globular clusters are composed of old stars, which, at around 10 billion years old, are much older than the Sun. These clusters are fairly common, with more than 150 currently known in our galaxy, the Milky Way, and more which have been spotted in other galaxies. Recently, however, high precision measurements performed in numerous globular clusters, primarily with the Hubble Space Telescope, has led some to question this widely accepted theory. In particular, certain stars appear younger and bluer than their companions, and they have been dubbed blue stragglers. NGC 6362 contains many of these stars.